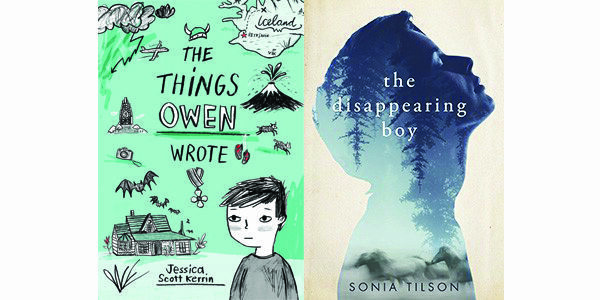 Two new middle-grade novels cover a lot of ground, both literally and figuratively. Neil, the 13-year-old protagonist of The Disappearing Boy, moves from Vancouver to Ottawa, then runs away to Saint John, New Brunswick. Meanwhile, Owen, in The Things Owen Wrote, travels from his home in Red Deer, Alberta, to Reykjavik, Iceland, over the course of a weekend. Neil is fleeing a family secret, while Owen is trying to cover one up. Both of these family dramas are deftly written and well-paced. Neil is a visual artist, who’s sensitive, mature, attentive to his single mother, and shy but open to making friends. He’s also single-mindedly focused on why his mother won’t tell him who his father is. Ottawa author Sonia Tilson sets out this parental mystery at the start of the book, reveals the secret halfway through, and then ramps up the action in the last half as Neil runs east, in search of a grandfather he’s only recently seen in a photo. Neil is convinced his mom’s father, who he’s told owns horse stables in New Brunswick, will help him sort through the new information about his background. But things don’t go according to plan. There are mature themes in this novel, involving gender identity in adults, which might be difficult to process for readers at the lower end of the intended nine-to-13-year-old audience. But with a parent’s guidance, this thoughtful book can serve as a powerful introduction to transgender issues or a new entry point in an ongoing conversation. While the story is about Neil’s journey toward understanding, acceptance, and forgiveness, the moral is one for parents: keeping significant secrets from your child can backfire horribly. In Jessica Scott Kerrin’s latest, Grade 8 student Owen is mortified when his grandfather, Neville, mistakenly sends his notebook to Iceland. There is something in that journal he’d like to keep private. Owen convinces Neville to take an impromptu trip to Reykjavik, a place the grandfather has always wanted to visit and where they’ll be able to retrieve the notebook. The recently widowed Neville happens to have two free airline tickets – so they’re off. While the reader is kept wondering what Owen wrote, we are privy to his other secret, and it’s one that should resonate with young readers. The budding photographer and poet feels like a bit of a fraud – “All Owen’s life, he’s been told how talented he is, how smart he is, no matter what he does.” But Owen wonders if he “sometimes coasts,” and doesn’t push himself or take risks. He realizes that he hasn’t always earned this unconditional praise. Owen’s attentiveness has also alerted him to his grandfather’s increasingly bizarre behaviour, from using the wrong kitchen utensils to packing only socks for the trip. While adult readers will immediately recognize the early signs of Alzheimer’s, Owen is quick to accept any justification Neville gives for acting oddly. Younger readers may not fully comprehend the dangers of Neville and Owen travelling on their own, but it provides a suspenseful narrative for those in the know. The actual things Owen wrote are certainly not as earth-shattering as the big reveal in The Disappearing Boy. But these books go beyond their simple plot devices. The appeal is in their quiet, artistic main characters coming to terms with their own fallibility and that of their family members.